If you haven’t been to Mount Baker Farm yet, now is your chance! This Saturday from 10-6, Mount Baker Farm will be hosting a Fall Festival! You won’t want to miss this. Come check out the farm, ride the train, play some games, eat some great local foods, participate in arts and crafts, and pet the farm animals! The weather is looking like it will be a perfect fall day to enjoy outdoors. Kids! Bring canned goods to donate to the food bank and receive 5 tickets to play games! I’ll be there with a booth for my class at the public school called Farm to Classroom. We will be making bird feeders and leaf rubbings. 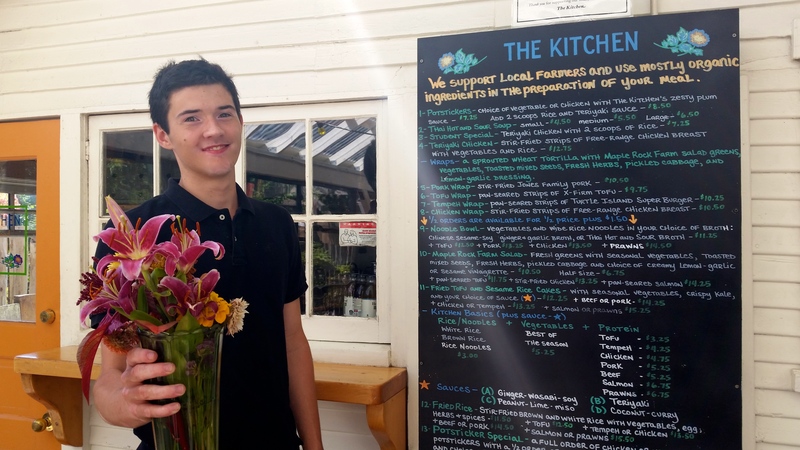 I’ll be sharing the booth with Chef Zach, also of the public school, who will be selling cups of yummy soup to raise funds for our Farm to Cafeteria program which purchases local products for our school lunches. Mount Baker Farm was a private estate until it changed hands last spring. The new owners decided to open it to the public and created spectacular camp sites in the back forest. Ruth, Cheryl and Barbara have been working hard since they took ownership to create a spectacular island getaway and local gathering place for our community. Last spring my students were invited to have train rides and tours of the farm. The excitement was palpable. You see, the children had all heard the train whistle over the years. They could see the track from the county road. The property was surrounded by a fence and large red gates. It was the great island mystery. Our very own Willy Wonka Factory, if you will. When we walked up to the gates for the first time and were greeted by Miss Cheryl on her green cart the kids went wild! Chasing after the cart. Running through the tall grass in the fields. Stopping to stand or lay across the real train tracks! You would have thought we were at Disneyland! I also had the opportunity to camp during the Farm’s “soft opening”. I was joined by some great friends. A group of four families with young children, we took over the large group area of the camp grounds. We had a fantastic time riding the train, petting the animals, exploring the meadow and the several interesting buildings. Later the mommas walked the entire train track winding through the property. We stopped in the back meadow to play some old carnival games and laughed like teenagers! An evening campfire with s’mores and lots of laughter had us ready for bed. We crawled into our tents and cuddled up under soft white covered comforters and laid our heads on scrumptious sleeping mats- all provided and set up by the Farm. At Mount Baker Farm you can bring all of your own camping gear, or you can rent theirs and they will even set it up for you! A long and productive spring in the school garden led right up to the last day of school! What better way to celebrate and culminate another school year than with a pizza party in the garden? Orcas Island Elementary students each spend one hour a week working in the school garden in a class I teach called Farm to Classroom. At almost 8,000 square feet, the school garden requires individual attention from each of the 200 students. Some children take on assigned tasks such as weeding, hauling compost and planting. Harvesting strawberries and pulling weeds. Other children take on projects of their own choosing. One class was dubbed “the diggers” for their love of digging! Another group of students took weekly responsibility for watering plants. One boy decided it was time to properly install the large stainless sink we salvaged from the old shop building before it was torn down. Each week he would lead a group in the many steps it took to put the sink in its final resting place. When the wood chips arrived, donated by Tim’s Tractor Service and delivered by Tim’s son James Segault of Island Climb Inc., the students ban together to move the massive mountain all around the garden. Throughout all of this garden work you can see real-world examples of children caring for the environment, working together, problem solving, communicating, using physical skills, and eating healthy. These are important life skills that no standardized test can ever measure. A delivery of wood chips for our paths from Tim’s Tractor Service and Island Climbing Inc. Working together to move a mountain of wood chips! Unloading a truck full of firewood. Many hands make for light work. A cornerstone of the children’s time in the garden is the idea that you may only enjoy the fruits of your labor, after you labor! The last ten minutes of each class is dedicated to “harvest time”. During this time the children graze in the garden, eating fresh from the plants they have nurtured. This may be one of the most rewarding times for me as the teacher. It only seemed fitting to end our school year with a garden pizza party using our cob oven. The pizza party couldn’t happen with out the help and generous donation of James Ferraris of Soul Flour Bakery, AKA The Pizza Man! James makes the best pizza dough and knows how to bring each pizza out with the perfect amount of doneness. James Ferraris of Soul Flower Bakery. Borage flower, mint and sorrel pizza. The children are the real artists at this event. They are supplied pizza sauce and mozzarella cheese. The rest is up to them! The toppings come from the plants they lovingly grew. Pizzas topped with strawberries, sorrel and mint are popular. Garlic scapes, borage flowers, rosemary and raspberries top others. There is no limit to the creations they come up with. After each pizza comes out of the oven the chef or chefs responsible tell their classmates what ingredients they used. Then the creators get the first slices and the other children sample after them. Pizza after pizza comes through in this way. The children turn into food critics, analyzing the combinations placed before them. The pizza is devoured and never are the usual pepperoni and sausage toppings missed. Purple majesty potato with chives and mint leaves. Rose petal, fava bean, borage flower and mint. Another remarkable year in the school garden has been completed. If you would like to see our garden please stop by and check it out. 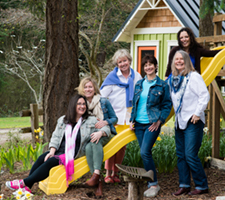 If you would like a tour of the garden, we will be on this year’s Orcas Island Garden Club tour June 25th and 26th. Now that school is out, I’ll be spending the summer with family and friends, taking road trips, and helping people buy and sell real estate on this amazing Island I call home. I love summertime on Orcas Island! Johnny visiting Momma in the garden. I sent my child into the forest with strangers and he came out more alive then ever! Did you know that Orcas Island has a Forest School? Forest School is relatively new idea in America but has been successful and commonplace in many European countries for several decades. The Orcas Island Forest School offers a play-based, all- outdoor, nature immersed and child directed education. Children ages 2.5 to 6 years old learn and play together in a multi-age, outdoor setting. When I first heard about the Forest School model I was instantly intrigued. My son Johnny wasn’t quite old enough and hadn’t fully potty trained so I had time to think it over. I teach at Orcas Island Public School where I created and teach a class called Farm to Classroom. I consider myself and outdoor educator since my classes take place in our school garden for most of the school year. I have seen first hand how valuable it is for children to spend time immersed in nature. I have seen the excitement of discovery. The glow of rosy cheeks, flush from the warmth of the sun or the sting of the wind and how that translates to a mind fully engaged. I want more of this for all of our school children. Ultimately I knew this was what I wanted for my youngest child too. I signed my son up for the morning session, two days a week. We talked about it. He seemed excited. We went on vacation and missed the open house day. We returned from vacation and tried to connect for a quick visit before the first day but life was hectic and it didn’t happen. I drove Johnny to see the forest site the evening before his first day. He seemed to be excited. On the day of Forest School we wake up early and pack Johnny’s lunch, something he has never done before. He is excited to get dressed and wear his long-johns under his clothes. We fill his new backpack with extra clothes, a water bottle, and the packed lunch. We get in the car and drive down the hill and across the main road to the back entrance of Camp Orkila where the Forest School is held. As we drive through the woods Johnny says, “Mommy, the woods are dark.” He is right, they are. Next he tells me he is nervous, gulp. We arrive and park in front of the big red barn. We meet another little boy who is coming for his first day also. We walk over to meet one of the teachers who is waiting in the field near the forest edge. Johnny starts to cling. Then he wants me to hold him. When we get to the teacher he can no longer speak. Oh no! I start to really regret not going to the open house! I know he is going to be safe and have a great time, but he is not quite three years old and he doesn’t have the same perspective. All of the children arrive and it is time for them to walk together into the deep dark forest, leaving their parents behind. Johnny is clinging tightly now. He won’t let go, he won’t say goodbye. I give him a hug and a nudge. His new teacher reaches down and asks if Johnny needs a hand with his new backpack. They walk off into the forest together. I hold my breath. I watch. At the edge of the forest he turns around and I wave. It is time for me to turn and walk back to the big red barn. As I do, I hear Johnny yell “momma” in that panicked voice that every parent fears. I wave again but keep walking. I hear him yell again and this time he is crying. Oh my God, I have just sent my son into the woods with complete strangers and he thinks I am abandoning him! I am the worst mom in the world! The other mothers comfort me in the parking area. I can still hear my sweet little boy crying for me and it is ripping my heart out. I start to cry. One of the other moms walks into the forest to see if the teachers want me to come get Johnny. She returns to report that he was in the arms of one of the teachers “snuggled like a bear cub”. He was whimpering, but showing interest in his surroundings. The other moms convince me to leave. The teachers have my number and I live just a two minute drive away. I drive away with tears in my eyes. I get home and look down at the forest below where I have just left my son, and I pray that I have made the right decision. Within a few minutes the phone rings, “Is this Johnny’s mom?” Oh no! My heart skips a beat. It is one of his teachers calling to tell me that Johnny has stopped crying and is currently exploring the forest with the other children. Yay! Two very long hours later I return to the camp and walk into the forest to the meet Johnny at the covered area where they hang back packs and keep supplies. My heart is racing as I get closer. I can’t wait to wrap my arms around my sweet little boy. I can’t wait for him to see that I haven’t abandoned him. But he is nowhere to be seen? I see other kids. Where is Johnny? One of the teacher sees my face and kind of nods in the direction of some little Superman boots sticking out from behind the shelter. I hear some whispering and snickering. I know this game! “Where is Johnny?” I ask loudly. He comes running out with his arms wide open. His smile is huge and his cheeks are flushed. Sigh. There is no time to ask the teachers how things went. Johnny is running into the forest leading me to his “favorite tree” and then off to his “favorite rock” and then shouting excitedly that he heard a wood pecker just like the one at our house. We finally get back to pick up his backpack and say goodbye. As he emerges from the forest I see that he has put his backpack on his front. I realize that it is much too big and he tells me that if he wears it this way it doesn’t tip him over! He leads me to some rocks and we sit on the biggest rock to eat his lunch. He talks excitedly about his morning in the forest. He tells me he wants to come back again and again. Phew! I am not the worst mom in the world after all! I am so excited that my youngest son has this opportunity. We have many amazing pre-school and school options on Orcas Island, all of them are unique and wonderful. I am grateful to live in a place that values the education and well-being of all our children. What a wonderful community to live in. 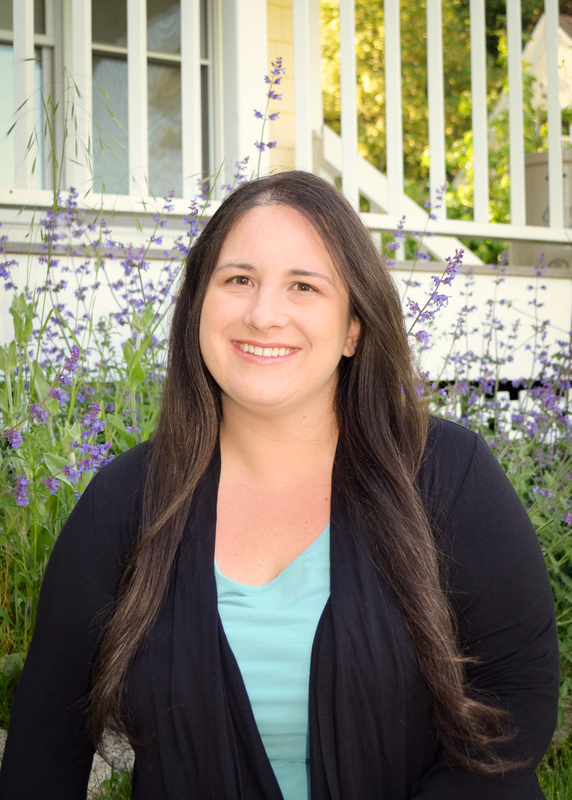 Mandy lives with her family on Orcas Island where she teaches at the local Elementary School and sells real estate at T Williams Realty. Here it is, March again. It certainly came in like a lion here on Orcas Island! I began thinking about the Lucky Irish as soon as my calendar turned. My Farm to Classroom students at Orcas Island Elementary got a baking lesson last week complete with some Irish history and basic chemistry. Bread soda was introduced in the early 1800s and it suddenly meant that people who didn’t have an oven—and virtually nobody had an oven then—could make soda bread. They cooked the bread in what’s called a bastible—a big cast-iron pot with a lid on it that would have been put right onto the coals or onto the turf fire. The great thing about soda is that it was not as perishable as yeast and it would have been relatively inexpensive. The Irish people would have had buttermilk from the cows (old-fashioned buttermilk is a by-product of making butter) and they would have been growing wheat, so they would have had flour (whole wheat of course). A very basic explanation of the reaction between the soda and the acidic buttermilk was followed by a classic demonstration of the concept using baking soda and vinegar. Time to make the bread! Traditionally a cross was cut into the bread before baking. Some people said it was to let the fairies out. Some said it was to keep the devil out. But most likely it was to help the bread bake evenly! Add some rosemary or other herbs for a dash of flavor. Bread is best when shared with friends! Preheat oven to 425°F. Lightly flour baking sheet (or cast iron pan). Mix flour, caraway seeds, if using, baking soda and salt in large bowl. Mix in enough buttermilk to form moist clumps. Gather dough into ball. Turn out onto lightly flour surfaced and knead just until dough holds together, about 1 minute. Shape dough into 6-inch-diameter by 2-inch-high round. Place in cast iron pan. Cut 1-inch-deep X across top of bread, extending almost to edges. Bake until bread is golden brown and sounds hollow when tapped on bottom, about 35 minutes. Transfer bread to rack and cool completely. My Friend turns 20 after 80 years! Oh, to be young again. I feel like it was only yesterday that I turned 20 years old. Now, I had the experience of helping someone turn 20 years young. Notice the different tense? I know, you’re thinking, what’s the difference? Today, February 29th, 2016, is the birthday of a dear friend of mine. Even though she has travelled the world for the last 80 years, fitting more than one lifetime’s worth of adventures into her journey, Ann turns 20 today. Ann is a “Leapling”, the name given to people born on Leap Day! Can you imagine? You come into this world, and then, as a child, you realize you only have a birthday every four years. 20 years old, and with a lifetime’s experience. Love, children, travel, careers, friends. I met Ann when I was a young girl. We both lived on Orcas Island in the small “town” of Olga, Washington. She became a family friend, and eventually my personal friend. Ann and her husband always bought whatever I was selling when I knocked on their door with the latest school fundraising idea in hand. She was there for my graduation, my wedding day, my baby showers. Ann loves to travel and I am usually the lucky one who gets to pick her up from the airport and hear about her latest adventure. Ann even became the first person whose home I listed when I became a realtor. This weekend we celebrated Ann’s birthday, which if you’re following along with me, doesn’t come along that often. Ironically, we celebrated Ann’s birthday a day early! Ann wanted an easy and delicious way to celebrate and so she invited her friends to a pancake breakfast. We gathered at our local American Legion Post for their monthly pancake breakfast which also serves as a fundraiser. Fresh buttermilk pancakes, crisp bacon, tender sausage, with eggs made to order. How could you go wrong? You can’t, especially if your friends are joining you on this special occasion, and then you follow it up with cake after breakfast. That’s right, you heard me, CAKE AFTER BREAKFAST! The delicious carrot cake was made with love and care from Bev at Café Olga. I know my two year old son thought it was an awesome way to celebrate, he even started off the Happy Birthday song for our friend Ann. What a wonderful time was had by all! Happy 20th birthday Ann! I am so grateful for this island that brought us together. Mandy with her son in the school garden. After a busy summer of family, fun, and real estate, I was ready to get back to school. The warm and dry summer did wonders for my spirit and for our school garden. While the grass had turned brown and crunchy across the island, our school garden was thriving with the addition of a drip watering system that Craig Sanders of Island Irrigation generously installed for us. September came, and so did the rain! The first day of school welcomed our students with a torrential down pour. The brown grass that had become our reality early in the summer turned green once again and we got another beautiful “Indian Summer” on Orcas Island. What a relief for this teacher since my best lesson plans revolved around days spent in the garden. The sunflowers had grown to great heights since the students patted the soil over the seeds last May. After enjoying their grandeur for several weeks we brought them down to harvest their seeds. The children enjoyed pulling each seed from the giant heads. Many seeds were eaten and many more were saved for replanting next season. The potatoes were dug with excitement and squeals of delight as each different potato was unearthed. The potatoes were boxed and put in cold storage for cooking projects later in the winter. The pumpkin patch was our newest expansion in the garden. We broke ground last spring, hand digging the area and carefully spacing our pumpkin seeds. We had a very successful harvest, growing over 200 pumpkins in our brand new patch! We had enough small pumpkins to send one home with each student! The larger pumpkins were processed in the classroom. We scraped them out and saved the seeds; roasting enough for everyone to enjoy a handful and saving the rest for replanting next spring. We baked and pureed the pumpkins and have over 100 cups waiting in the freezer for our pumpkin pie baking lesson. There are so many jobs to do in the school garden. With over 215 students spending an hour a week in the garden you would think we would run out of jobs to do, but we never do! Beyond the harvesting of herbs, tomatoes, calendula flowers, kale, watermelon, and carrots, there are many other garden jobs to take part in. Raking the leaves of the maple tree is a favorite job for many. We learned that one way we can keep our beloved tree healthy is to rake its leaves up under it and let them compost there over the winter, in essence feeding the tree! With only 5 rakes available the kids must regulate taking turns. We are not just feeding the tree, but also practicing our social skills. We are lucky to have wood chips donated to our garden by John Olsen, the Tree Doctor. The kids spend lots of time reinforcing the pathways with wood chips. In this process they learn to work together and even team up to fix a broken wheel barrow! The children work hard and see the results of their work. One of the most difficult garden jobs is the pruning of the blackberry bushes. While we appreciate the natural fence the bushes provide and the delicious berries, we are in a constant battle to keep them from taking over two edges of our garden. The work is hard and often times painful, but there are always students who are willing to do it. After putting in all of this work we remind the students of why we do this by rewarding them with 10 minutes of harvest time at the end of each class. This is when the students scramble to create the most delicious “garden burrito” possible! It is gratifying to the adults who witness this time as we watch the children happily eating their veggies. We harvested, composted, dug and double dug. We created new beds and cover cropped old ones. We put our garden to bed for the winter. And to celebrate we fired up our cob oven and had a PIZZA PARTY! With the generous donation of his time and talent, James Ferraris of Soul Flour Bakery helped us to make the best garden pizzas ever! There was pizza sauce and mozzerella cheese as a base. The rest was left up to the creativity of the children, and creative they were. The ingredients were all fresh from the garden. There were ground cherries and rosemary, sorrel and chives. You name it, they made it. Yes, there was even a worm pizza. One little girl said, “I didn’t think I’d like a vegetable pizza, but I tasted it and I do!” This is what it is all about. Showing kids where food comes from, teaching them to work hard, and watching them enjoy the fruits of their labors. Happy harvest season to you all! Not a lot has changed since I was a teenager growing up on Orcas Island 20-25 years ago, and that’s not a bad thing. The Sea View Theatre still shows one movie a week and The Village Stop, (Con’s) still has soft serve ice cream. 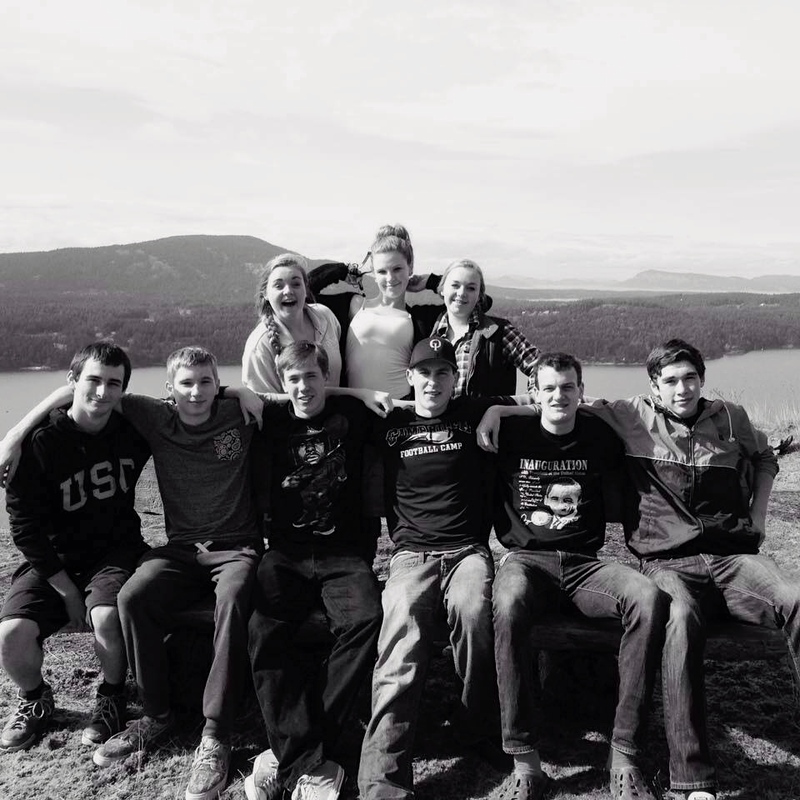 Being a teenager on an island is actually pretty great, especially Orcas Island. The days are long and the weather is generally perfect with average temps in the 70’s and clear, sunny skies. Our island is a major tourist destination during the summer which means that local businesses are in need of seasonal help. 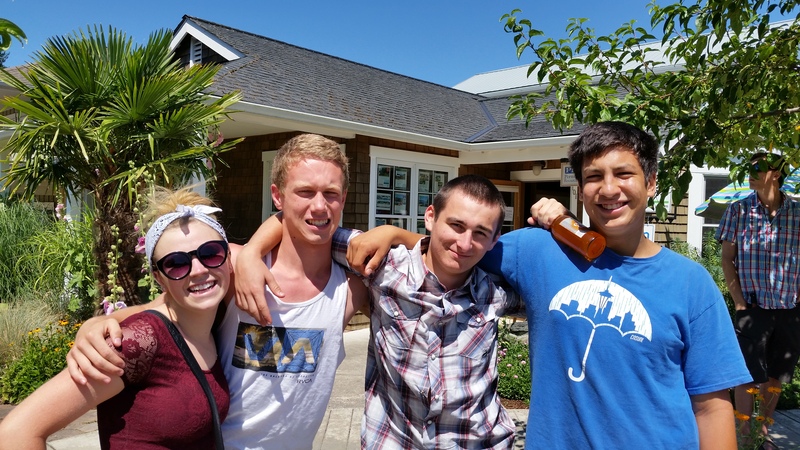 Orcas teens are fortunate to have the opportunity to learn new skills and make some money each summer. The jobs are plentiful and range from store clerks to firewood splitters and everything in between. Here are a few Orcas teens that I came across at work recently. Dropping my son off for a day of fun at Kaleidoscope Preschool and Childcare Center, he runs straight into the arms of Emma Minnis, a high school Senior who spends her days getting messy with the toddlers! Off to Island Market I am helped by high school Junior Rowan Lister. It is humbling to ask him to reach things on the high shelf for me, after-all I have known him since he was a baby! After handing me the item I ask him what he is saving his money for. He tells me that he wants to buy a knight’s suit of armor for his younger brother! Shhh… it’s a surprise! 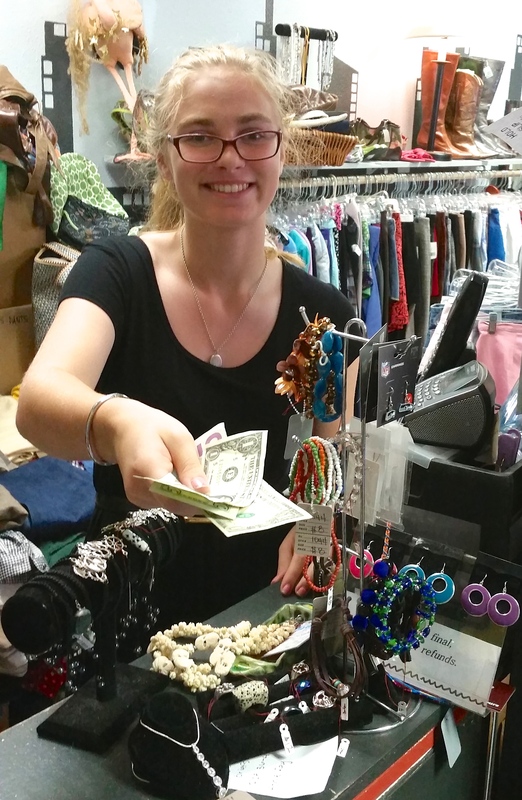 At the local clothing consignment store Sequel, I run into Junior Bethany Hansen. She is just as friendly as always even though she is on the tail end of a 52 hour work week. She works nights at a local restaurant, as well as her day job at Sequel. She says not all weeks are like this, but she wants to earn a lot of money so she can buy a car before school starts. Walking past The Kitchen I see a familiar face, it’s Brother Murphy! Brother is a high school Junior and all around friendly guy so his job at The Kitchen is a good fit. The Kitchen serves fresh Asian food in a relaxed outdoor environment. Brother helps prep the food, serve, and does the dishes. All good life skills! 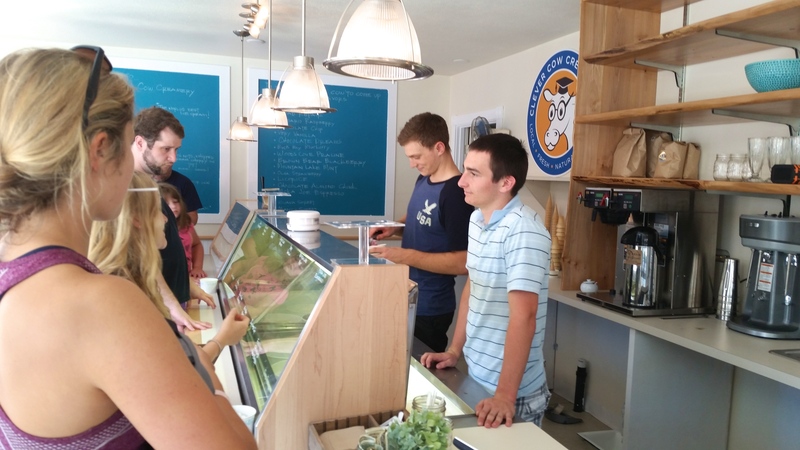 I decide to stop in and see my son Jordan Randolph at the recently opened and very popular Clever Cow Creamery. The line is out the door with people anxiously awaiting a taste of the locally produced handcrafted ice cream. I work my way in and find Jordan and co-worker Kyle happily scooping and serving ice cream. The line doesn’t let up in the time I am there and Jordan tells me later that they didn’t see a break in the line for three hours! As I watch, I see the boys working steady, having pleasant interactions with the customers, and even cracking a few jokes along the way. I am filled with overwhelming “mom pride” as I walk away. My son has grown into a capable and kind young man. I knew this already but seeing him at work somehow makes it more real. 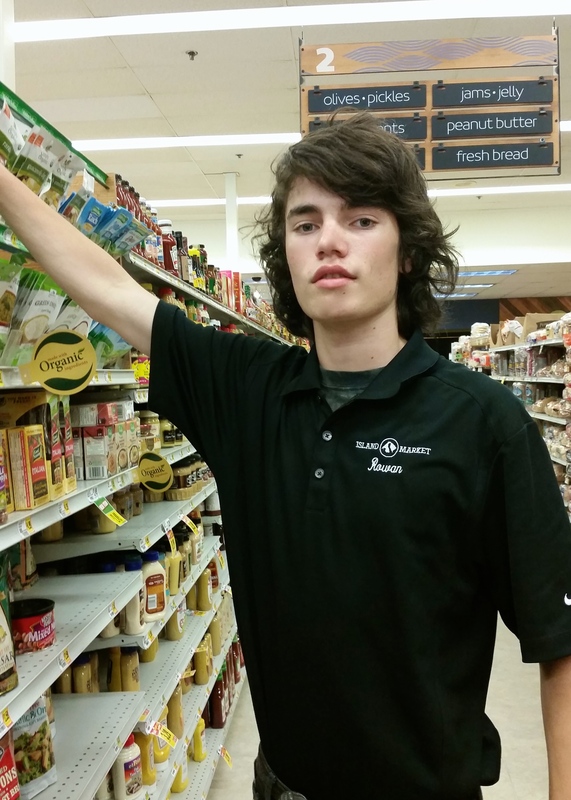 I appreciate the owners of the Clever Cow for giving my teenage son his first “real” job. 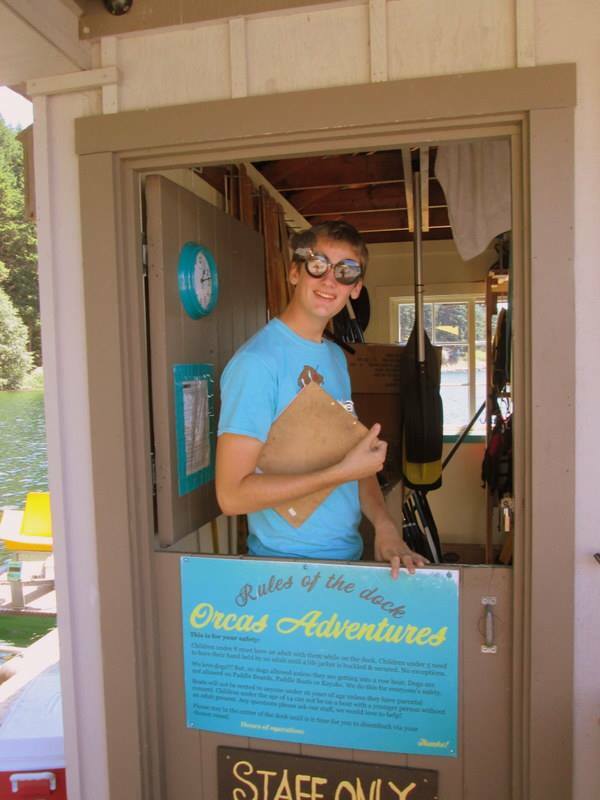 Out at Moran State Park the owners of Orcas Adventures rely heavily on Orcas teens to keep a safe and fun working environment. 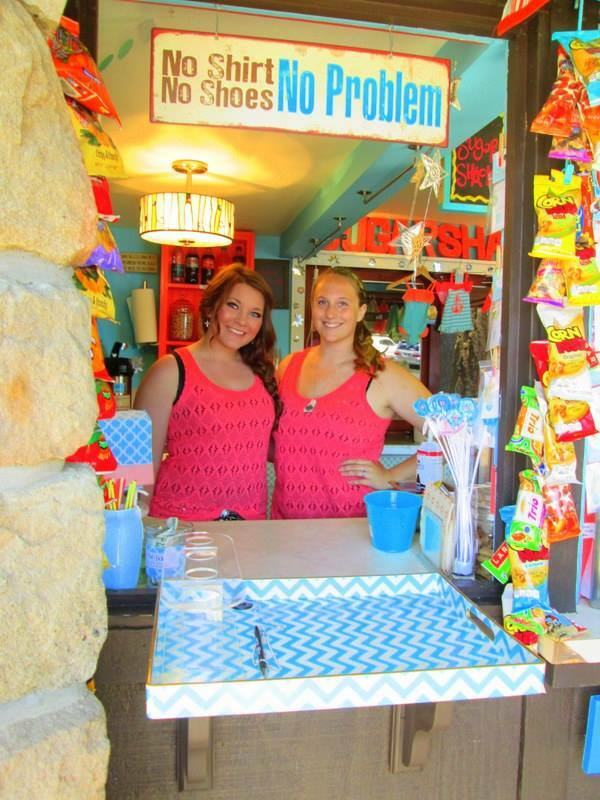 Owners Edward and Fiona Stone grew up on Orcas and were once teens looking for summer work themselves! 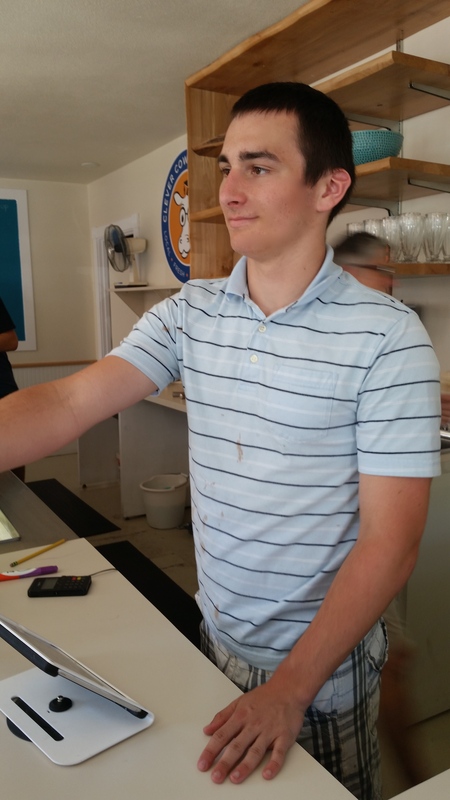 There are currently six high school and college students working the Sugar Shack and the Boat Dock. 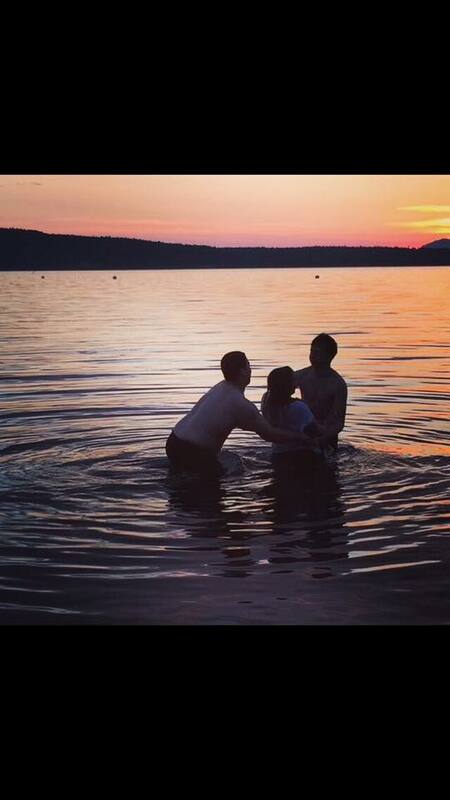 Yes, Orcas graduates do consistently come back for summer work on Orcas. Why not? The work is readily available and the rent is usually free! 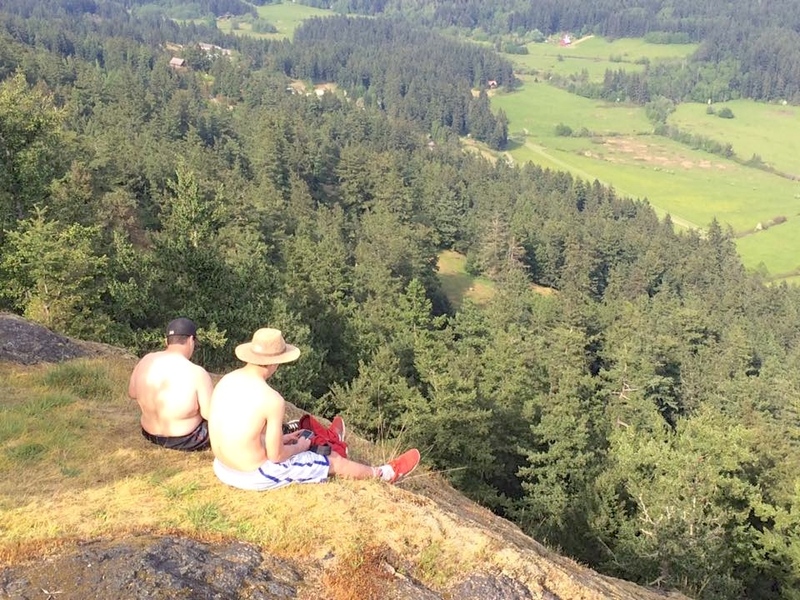 It’s not all work for Island teens, they know how to make the most of their free time. With no malls to hang out at, and only one movie showing per week, our kids have to get more creative. 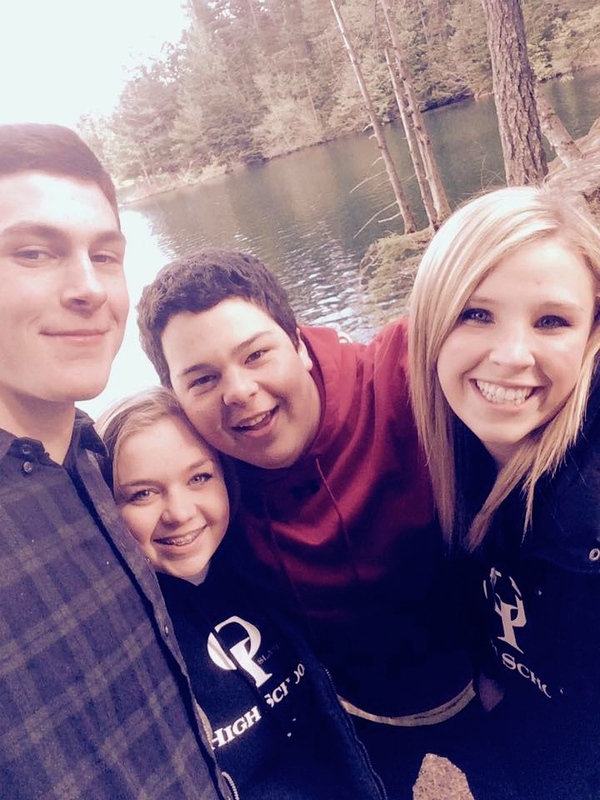 Orcas teens know they have it good. They take advantage of the beauty that surrounds them. You will find them swimming, hiking, fishing, biking, boating, beach-combing, and sunset watching. Here are a few pictures I found on facebook from some of my son’s friends (yes, they gave me permission to use them). 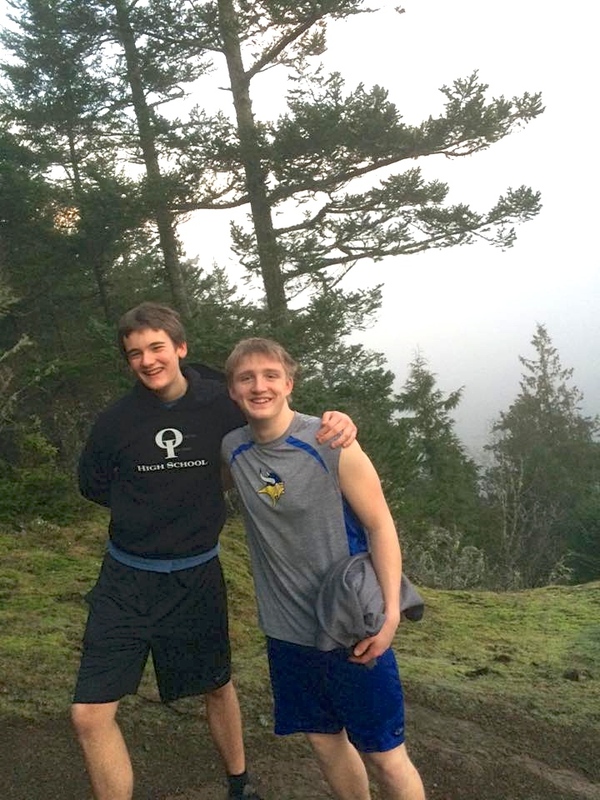 A morning run on Mt.Constitution! Friends hanging out at the lake. 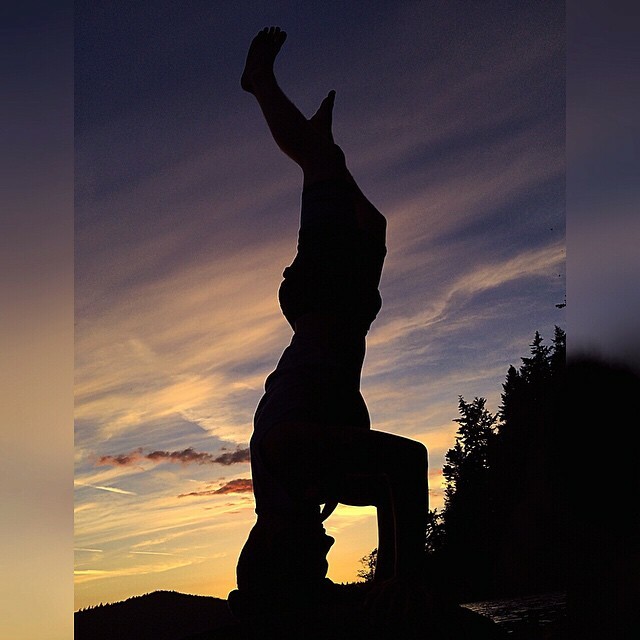 Sunset toss in the Salish Sea! Stopping by to see mom at TWilliams Realty! It’s a charmed life for sure! I am grateful to have been raised on this amazing island and so happy that I am providing the same opportunities for my children. 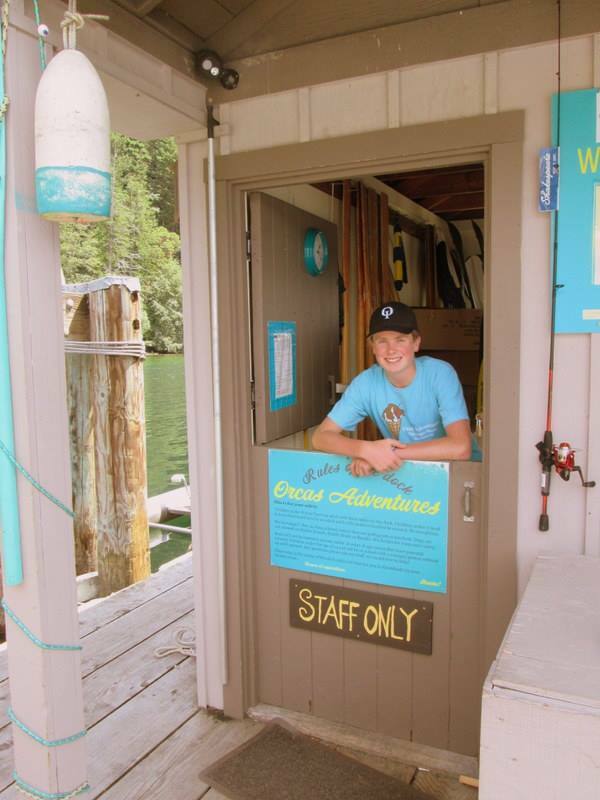 If a move to Orcas Island is in your future please give me a call and I’d be happy to show you around… Island Style! 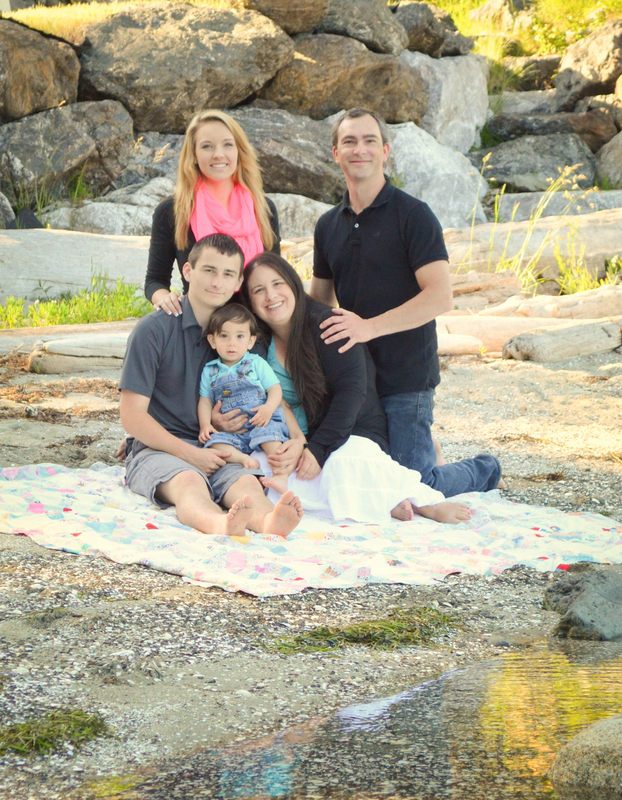 Mandy and family on beautiful Orcas Island!